In this Wave.video review, I’ll share how you can finally get excited about video creation and editing, because Wave.video makes it so easy you’ll think you’re cheating. 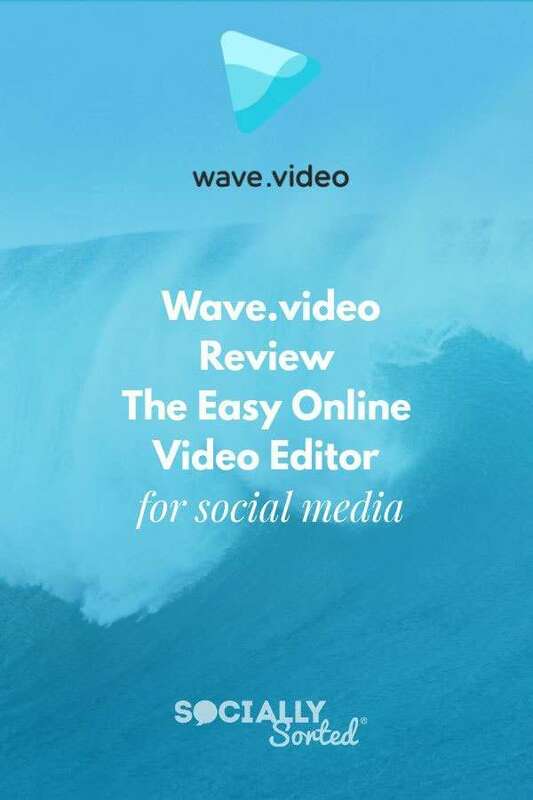 Wave.video is a quick and easy online video editor for social media. 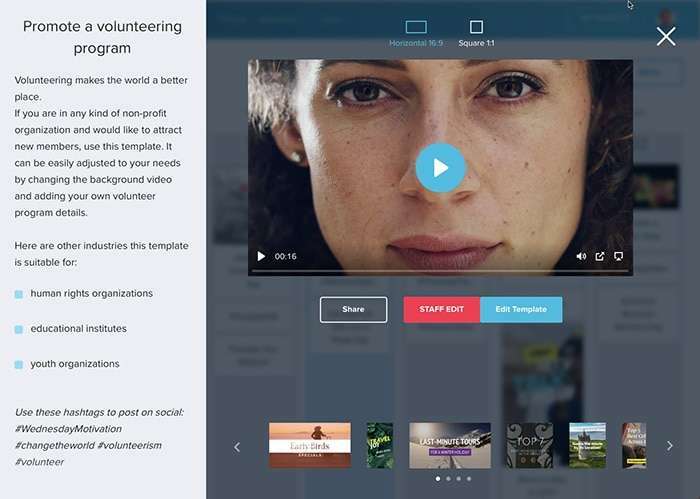 In this post I walk you through all the features of Wave.video to show you how easy it is to create engaging videos for any of the social media platforms. I’ve been using Wave as my preferred online video editor for almost a year now. I haven’t rushed into doing this review. I like to sit with a tool, learn how to use it, watch it develop and try new features as they’re added. And boy oh boy, have Wave been adding new features lately… features that I LOVE. It’s also why I recently became a Brand Ambassador for Wave and share the tool regularly with my community. 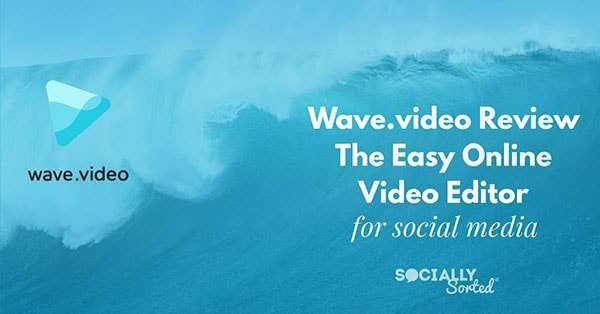 So let’s take a look at why social video is so important at the moment, why you might consider using an online video editing tool like wave.video to create social video, and why Wave.video is a great option for you to consider as the No1 video creation tool in your tool box. Videos under 90 seconds see an average retention rate of 59% but videos over 30 minutes retain only 14%. We like watching short videos to the end! 75% of videos in the last year are less than 2 minutes long. Businesses are producing an average of 33 videos per month, up a whopping 83% from 2017. There’s no doubting that it’s a great time to get started with video. Yet many business owners get stumped when it comes to the actual creation of the videos! They don’t understand the tech, they are not comfortable talking on camera… or they’re just not sure what to create. 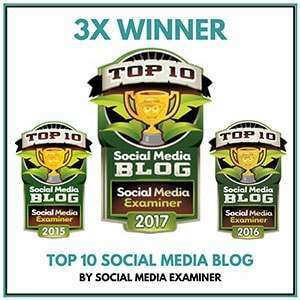 Allowing you to Publish the videos in multiple formats so you can easily optimize the videos, and share them across multiple social platforms. In this post, I share a full overview of Wave. But if you’re a visual person and want to jump ahead and see it in action, you can check out my video walkthrough below. If you try Wave via my affiliate link and upgrade to a paid account, I will receive a small commission at no cost to you. Now, let’s take a look at some of the stand out features of Wave video editor in more detail. What are the Stand-Out Features of Wave.video? 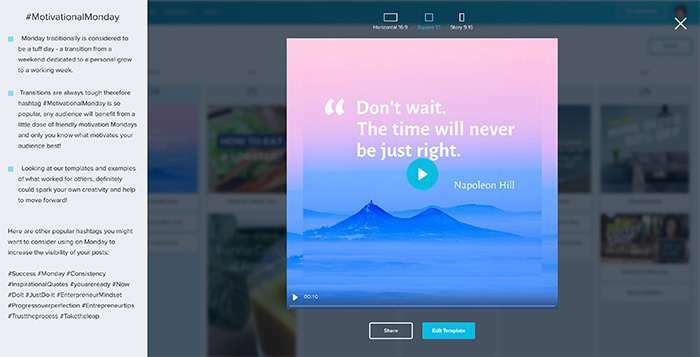 Instantly resize your videos to over 30+ formats (optimized for every social platform) – and it’s all in one-click! Access over 200 million stock video clips, many of which are free on the paid plans (or low-cost-per-use). Import your own assets like images, videos and audio files. Add text to videos with a huge range of fonts to choose from. Growing selection of templates to help you create videos quickly and easily. Easily edit and preview videos. These are just a few of my favourite features in Wave. Got your attention? Let’s take a look at why I love Wave.video so much (and why I am quietly confident you will love it as an online video editor too!). And don’t forget you can view the video at the top of the page at any time for my complete tour. Oh and did I mention that they now have a really handy Content Calendar and the ability to add Stickers to your videos? You’ll need to scroll to the bottom of this post to see them in action. But it’s worth it, trust me. As I said above, the team at Wave.video are always rolling out new features that make video content creation sooooo much easier (and in most cases, more fun!). This has been one of the things I really missed in Wave.video until recently. Now that they have a growing library of video templates it makes your video creation soooo much easier. The templates come in a number of different themes and styles to get you started! Previously you could only use fixed text in 9 different positions on the canvas. Now you can “free your text”, move it rotate it and place it in any position on the canvas. I LOVE this as it gives so many more creative options. And when you need more structure, the fixed-position text is handy too. They work hand-in-hand. These tabs/folders make it easier to keep track of great images, video and audio clips you purchase or upload. And you can save any Favorites you see for later. Now, when I stumble across an awesome music clip and think “I’ll use that later”, I won’t forget about it! Now you can clip and trim your audio, add multiple music tracks and even add your own audio content (hello podcasters!). I’m leaving some of my favorite “Wave.video things” till last. Oh my. I’m a little excited about Stickers. This feature is awesome for finding inspiration for social videos. It’s just been released and you’ll love it. 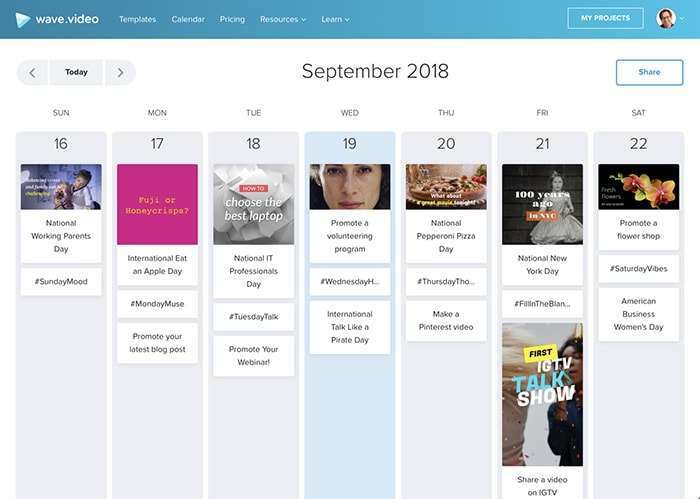 Calendar gives you timely ideas and inspiration on what to post each and every day of the year. This includes local, national and international holidays, themes and events. 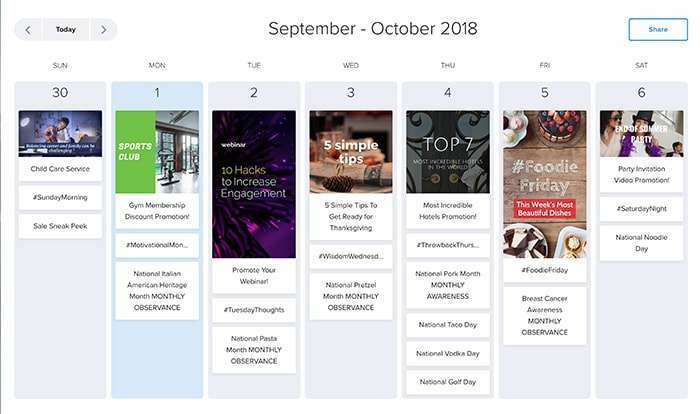 Events, themes and holidays for that particular day to help you create video content and other types of social media content/posts. Relevant Hashtags and tips for making your brand relevant in the social conversation with video. A video template almost every day of the year (sometimes more than one) that you can use to match the daily themes and events. If I click on any of the items I get a pop up screen, showing me more information for sharing. In this case, I chose a #MotivationMonday post and it gives me a whole lot of tips and hashtags to use with my #motivationmonday video. Winning! Or maybe it’s a local, national or international day of celebration you want to post about. Who can resist posting about National Taco Day? 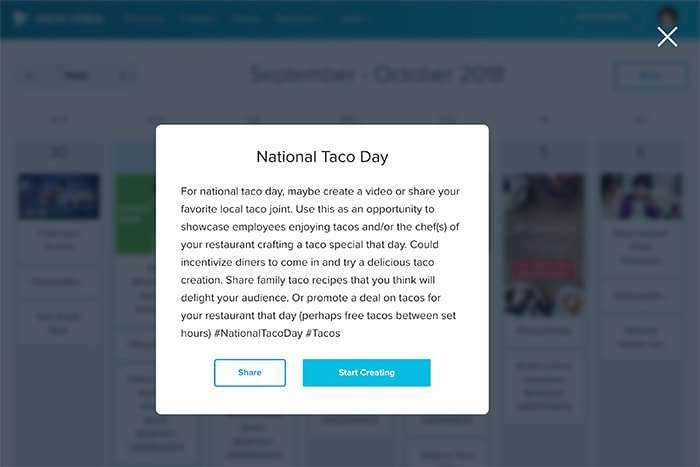 Again, when I click on National Taco Day, I get tips and ideas for creating and sharing my video. Even tips for in-house promotions in my business. Now we have no excuse to Taco ’bout the content that’s relevant to our audiences. Sorry, I couldn’t resist. Do you love Wave’s Calendar as much as I do? I get the feeling I’ll be using this a LOT in my business. You can find out more about Wave’s Calendar here. Click the Calendar tab at the top of the screen. And if you want to upgrade to using their templates, you can do so here. And wait, there’s more new features to love! 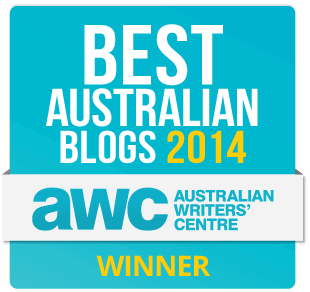 The voiceover function and the ability to upload your own audio clips is a winner …. hello, Podcasters, do you agree? Are you loving these features? Honestly most of these Wave.video features need little demonstration or tutorials as they are very intuitive to use the first time you play with Wave.video. It’s one of the things I love about Wave – how you can just jump in and start using it without much training. That’s the sign of a great user experience, right there. My 12 year old son made a video using transitions, video, images, text and more the first time he tried the tool. Ok, he’s a little more savvy than me when it comes to tech, but it’s a great sign that the tool has been well designed for ease-of-use. That’s what we want to hear as busy business owners.. that it is quick and easy to create video. Ready to take Wave.video for a spin? 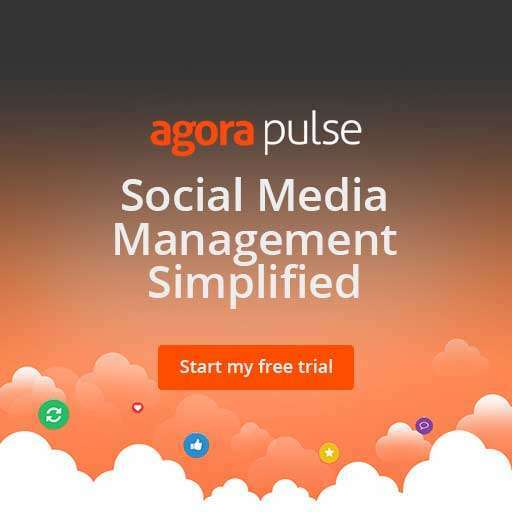 If you love the look of the features, why not grab a free trial? You can take Wave.video for a spin here using this link. Remember if you upgrade to a paid version of Wave after clicking on this link, you’ll get a 10% discount by using my referral link. Wave starts at $39 USD per month (paid annually) and just $49 per month (paid annually) if you want to be able to create videos for clients (ie 3rd part resale rights). It’s very affordable for small businesses right through to agencies. Are you creating social video? Are you afraid of creating video? Will you try Wave.video now that you know how easy it is?